Kir is Kerak - Amo 1:3-5 - Damascus will flee to Jordan! Kir is Kerak – Damascus refugees will soon flee to Kerak, Jordan! Damascus refugees will soon flee to Kerak, Jordan! The Prophet Amos condemned Damascus. He said that God would send an army against Damascus and that the Syrian people would become refugees in Jordan. This prophecy was fulfilled when Tiglath-pileser the Assyrian king conquered Damascus (734 B.C.) and carried the Syrian (Aramean) captives away to Kir (mountainous region in western Jordan). However, like many bible prophecies this may also refer to a current event. Today the city of Kir in Jordan is called Kerak. 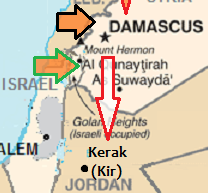 Kerak is in south western Jordan east of the Dead Sea. It has a population of about 20,000. Not including the tens of thousands of Syrian refugees already there.The citizens of Kerak are poor and mostly Christian. By the way Kerak is in the Moab region of Jordan and is very likely where the Judean refugees will flee during Jerusalem’s Great Tribulation! There are about 600,000 Syrian refugees in western Jordan today. This is further evidence that the destruction of Damascus as described in the bible is eminent. It is also evidence that the God of Israel is the one true God and that we all had better heed his word and we had also better humble ourselves before him while there is still time! In Amos 1:5 the plain of Aven is a valley in the northeast part of Lebanon near the Syrian border. Today it is called the Bekaa valley. It has been suggested that Saddam Hussein hid WMD’s here before the invasion of Iraq. Amo 1:3-5 Thus saith the LORD; For three transgressions of Damascus, and for four, I will not turn away the punishment thereof; because they have threshed Gilead with threshing instruments of iron: 4 But I will send a fire into the house of Hazael, which shall devour the palaces of Benhadad. 5 I will break also the bar of Damascus, and cut off the inhabitant from the plain of Aven, and him that holdeth the sceptre from the house of Eden: and the people of Syria shall go into captivity unto Kir, saith the LORD. God used the terminology to send a fire to mean that the Assyrian army would besiege the city. Just as the ancient Assyrians assaulted the city in 734 BC, I think that the Turkish army will do likewise soon. The palaces of Benhadad refer to the ancient thrones of Syrian Kings in Damascus. Like the ancient invasion, this future invasion will also destroy Damascus’ seat of government in the old part of Damascus. Tens of thousands of Syrians have already taken refuge in Kir (or Kerak) in western Jordan. Many more will join them as Damascus flees. Bible prophecies are coming true. There is a terrible time of Satan’s anger and of God’s judgement coming on all of the world. It is High Time to surrender your soul into God’s care. Isaiah 17 and Jeremiah 49 also predict the destruction of Damascus, Syria. They both offer details that can be observed today! I will check out the radio show on my Easter Break. Today in the Yeni Safak, there were two articles in regards to Erdogan. The first: Erdogan Calls for Mobilization Against Terrorism.” He actually said “war in the manner of World War I. The second: Erdogan calls for Assad to be tried in the ICC. I thought the first article was a good example of the AC worshiping the God of war. Turkey is requesting access to Ghouta, while Iran and Russia are agreeing that the Crescent should provide aid. They have also talked about providing safe passage for the refugees. That’s because Ghouta is a Sunni Al-Qaeda neighborhood. Still that brings Turkey into Damascus. So, Turkey is in Damascus now? Does that mean Damascus will be destroyed soon? Thank you for your help with keeping everyone updated on what is happening and why over there. Hi Jennifer. No Turkey isn’t in Damascus yet. The Turkish Army is fighting in the Afrin region of northwestern Syria.